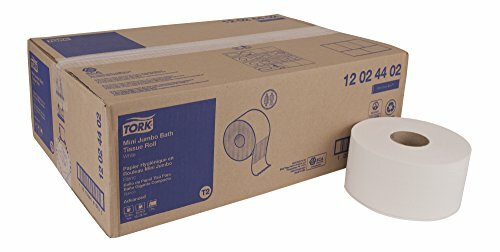 Tork Advanced Mini Jumbo 2-Ply Bath Tissue's high capacity allows for fewer refills and reduced labor. Our roll design ensures easy and intuitive maintenance, refilling and use. Large size reduces pilferage as it is hard to conceal and can't be used at home. Suitable for high to medium traffic restrooms and easy to maintain. Fewer cores and no wrappers leads to source reduction and less waste. Reduced stub roll means less waste. Tork toilet paper has rapid breakup, ideal for all plumbing systems. Made from 100% recycled fiber, with a minimum of 20% post-consumer fibers, providing environmental benefits and is a positive image builder. Available in an Easy Handling Carry Box. ECOLOGO Certified and EPA Compliant. Can be used with Tork 465500, 555020A, 555028A, 5555200, and 5555290 bath tissue dispensers. Tork Advanced 2-Ply Bath Tissue is a soft and absorbent bath tissue which tells the user that you care about their comfort. Handsomely embossed, it enhances bulk and softness. Special tightly wound rolls and easy start tail seals to prevent waste and aid in source reduction. Each roll is elegantly wrapped ensuring sanitary protection while delivering quality, value, and performance. Tork toilet paper has rapid breakup, ideal for all plumbing systems. Tissue is made from 100% recycled fiber, with a minimum of 20% post-consumer fibers, providing environmental benefits and is a positive image builder. Number of sheets: 500. Sheet length: 3.75-inches. Core inside diameter: 1.65-inches. Roll measures 4.35-inches diameter by 156.25-feet length by 4-inches width. White color, perforated. Available in an Easy Handling Carry Box. ECOLOGO Certified and EPA Compliant. Can also be used with the Tork 59TR Bath Tissue Dispenser. 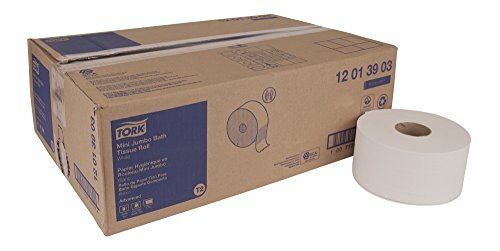 Tork Advanced Soft Mini Jumbo 2-Ply Bath Tissue's high capacity allows for fewer refills and reduced labor. Our roll design ensures easy and intuitive maintenance, refilling and use. Large size reduces pilferage as it is hard to conceal and can't be used at home. Suitable for high to medium traffic restrooms and easy to maintain. This bath tissue is perforated for ease of tearing. Fewer cores and no wrappers leads to source reduction and less waste. 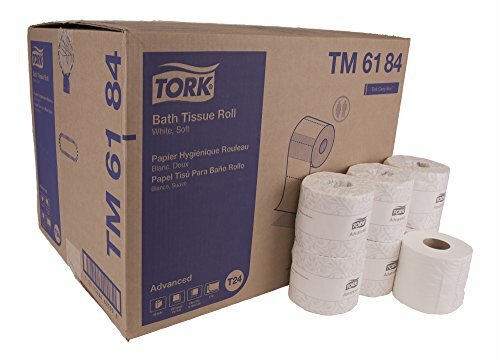 Tork toilet paper has rapid breakup, ideal for all plumbing systems. This product contains 20% post-consumer fiber, providing environmental benefits and is a positive image builder. Perforated. EPA Compliant. 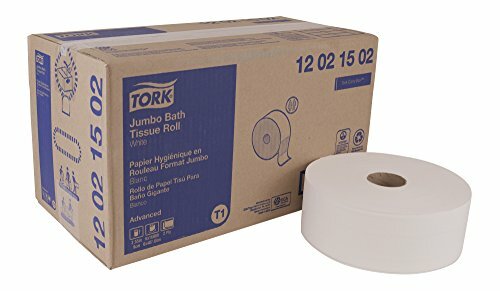 Can be used with Tork 465500, 555020A, 555028A, 5555200, and 5555290 Mini Jumbo Bath Tissue Roll Dispensers. Tork Advanced Soft 2-Ply Bath Tissue is a soft and absorbent bath tissue which tells the user that you care about their comfort. Handsomely embossed, it enhances bulk and softness. Easy start tail seal to prevent waste. Each roll is elegantly wrapped ensuring sanitary protection while delivering quality, value, and performance. Tork toilet paper has rapid breakup, ideal for all plumbing systems. Tissue made from 20% recycled fiber, with 20% post-consumer fibers, providing environmental benefits and is a positive image builder. Available in an Easy Handling Carry Box. EPA Compliant. Can also be used with the Tork 59TR Bath Tissue Dispenser. Tork Advanced Mini Jumbo 1-Ply Bath Tissue's high capacity allows for fewer refills and reduced labor. Our roll design ensures easy and intuitive maintenance, refilling and use. Large size reduces pilferage as it is hard to conceal and can't be used at home. Suitable for high to medium traffic restrooms and easy to maintain. This bath tissue is perforated for ease of tearing. Fewer cores and no wrappers leads to source reduction and less waste. Tork toilet paper has rapid breakup, ideal for all plumbing systems. Tissue is made from 100% recycled fiber, with a minimum of 20% post-consumer fibers, providing environmental benefits and is a positive image builder. Available in an Easy Handling Carry Box. ECOLOGO Certified and EPA Compliant. Can be used with Tork 465500, 555020A, 555028A, 5555200, and 5555290 Mini Jumbo Bath Tissue Dispensers. Tork Advanced Jumbo 2-Ply Bath Tissue's high capacity allows for fewer refills and reduced labor. Large size reduces pilferage as it is hard to conceal and can't be used at home. A perfect choice for high-traffic restrooms as well as environments where efficiency and reduced cost are priorities. Suitable for high to medium traffic washrooms and easy to maintain. Fewer cores and no wrappers leads to source reduction and less waste. Tork toilet paper has rapid breakup, ideal for all plumbing systems. Made from 100% recycled fiber, with a minimum of 20% post-consumer fibers, providing environmental benefits and is a positive image builder. Available in an Easy Handling Carry Box. ECOLOGO Certified and EPA Compliant. Can be used with Tork 554020A, 554028A, and 247549A Jumbo Bath Tissue Roll Dispensers. 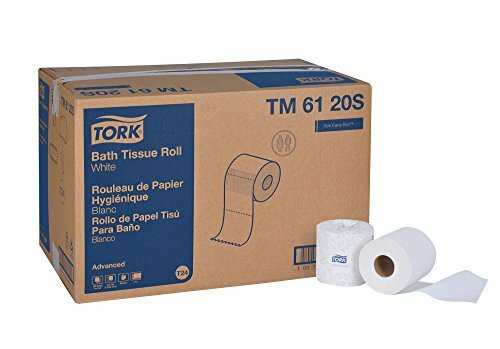 Tork Advanced High Capacity 2-Ply Bath Tissue provides hygienic dispensing while reducing waste and maintenance expense. Enhances image to everyday restrooms with limited space. High capacity rolls eliminate service outages. Banded roll and easy start tail seal to prevent waste and aid in source reduction. Embossed rolls enhance bulk and softness. Tork toilet paper has rapid breakup, ideal for all plumbing systems. Made from 100% recycled fiber, with a minimum of 20% post-consumer fibers, providing environmental benefits and is a positive image builder. Available in an Easy Handling Carry Box. ECOLOGO Certified and EPA Compliant. For use with Tork 555620 and 555628 High-capacity Bath Tissue Dispensers. 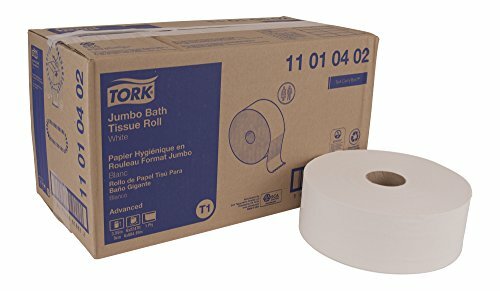 Tork Advanced Jumbo 1-Ply Bath Tissue's high capacity allows for fewer refills and reduced labor. Large size reduces pilferage as it is hard to conceal and can't be used at home. Perfect choice for high-traffic restrooms as well as environments where efficiency and reduced cost are priorities. Suitable for high to medium traffic restrooms and easy to maintain. This bath tissue is perforated for ease of tearing. Fewer cores and no wrappers leads to source reduction and less waste. Tork toilet paper has rapid breakup, ideal for all plumbing systems. Made from 100% recycled fiber, with a minimum of 20% post-consumer fibers, providing environmental benefits and is a positive image builder. Available in an Easy Handling Carry Box. ECOLOGO Certified and EPA Compliant. Can be used with Tork 554020A, 554028A, and 247549A Jumbo Bath Tissue Dispensers. 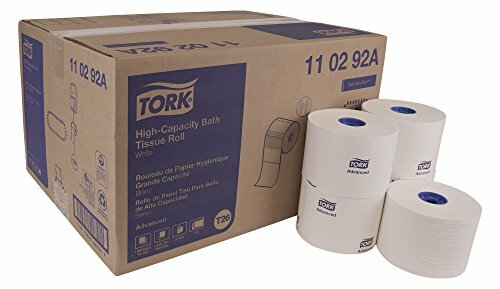 Tork Advanced Coreless High Capacity 2-Ply Bath Tissue has twice the capacity for fewer maintenance intervals and reduced risk of product run-outs for improved patron satisfaction. Allows you to manage waste effectively and responsibly with less trash to remove and more time for the other tasks. Ideal for low to medium traffic washrooms with high focus on guest satisfaction. 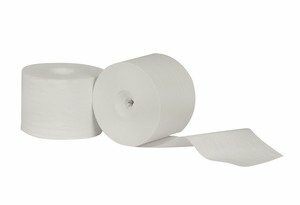 - Poly-bundle packaging reduces inventory space required, making refill storage and retrieval easier than traditional roll tissue. 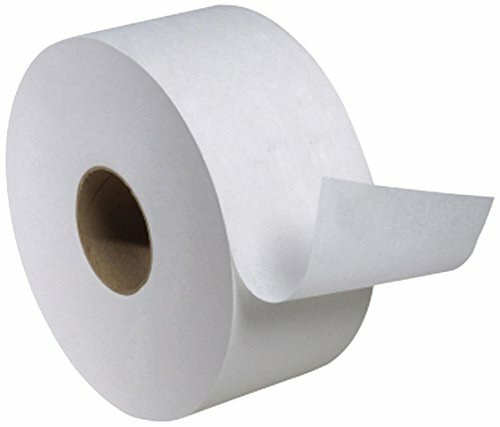 - Without the core, you gain more - two high-capacity rolls are equivalent to five rolls of conventional bath tissue. - Soft quality tissue with an embossed pattern delivers the comfort of 2-ply softness with reliable performance you can count on. - This product contains recycled fibers (minimum 40%) and a minimum of 20% Post Consumer fibers - environmental benefits and positive image builder. - EPA Compliant and FSC certified for reduced environmental impact.